The Kelburn Garden Party is back for 2018. Return to the magical lands of Kelburn Castle on Scotland's West Coast for a festival like no other, an explotion of creative energy set in stunning natural surroundings comprising world class music, site-specific art, interactive experiences, theatre, cabaret and a healthy dose of pure party vibes. It's a cultural safari for the mind, body soul and quite frankly unmissable for the serious festival-goer, young and old. 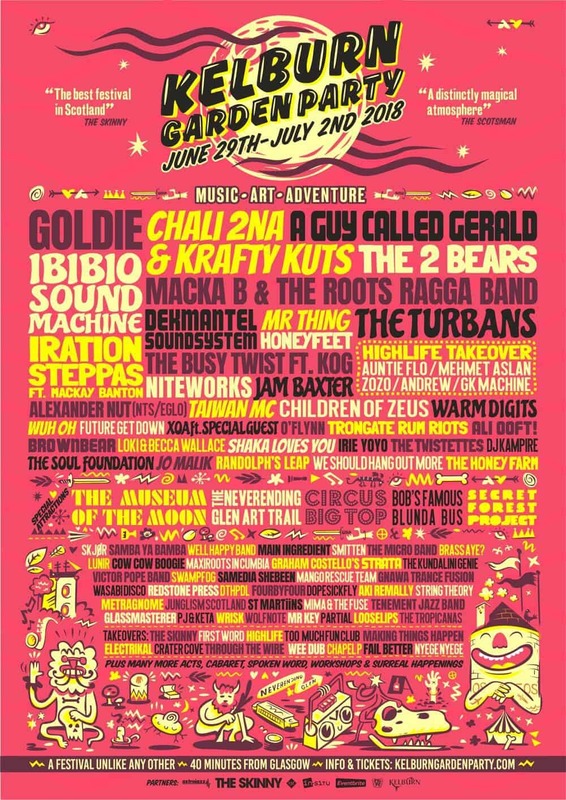 Featuring GOLDIE, CHALI 2NA & KRAFTY KUTS, A GUY CALLED GERALD, THE 2 BEARS, IBIBIO SOUND MACHINE, MACKA B & THE ROOTS RAGGA BAND, DEKMANTEL SOUNDSYSTEM, NITEWORKS, AUNTIE FLO, THE TURBANS, IRATION STEPPAS, THE BUSY TWIST among many others. Special Attractions: THE MUSEUM OF THE MOON, THE NEVERENDING GLEN ART TRAIL, LET'S CIRCUS BIG TOP, THE FAMOUS BLUNDA BUS, THE SECRET FOREST PROJECT... are amongst the many non-musical highlights at Kelburn. Expore The Music Programme Here: www.kelburngardenparty.com/whats-on/music-programme. TIER 1-3 TICKET SOLD OUT.